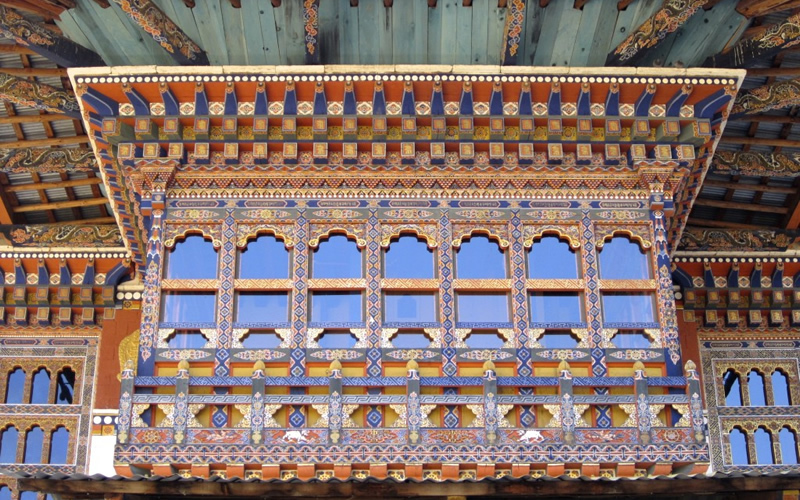 On a recent trip to Bhutan, I fell in love with the stark, snow-capped Himalayas, the orange and blue and green and yellows of the painted lintels on the houses, terraced hillsides littered with shaken rice sheaves, first-growth mossy forests, and black-necked cranes that migrate from the Tibetan plateau. The dragon kingdom, Bhutan is a country of humble Buddhist people with tales of flying tigers and sorcery and incarnations, where mountains and streams are sacred, and the wind sends shreds of prayer flags from bridges and mountaintops up to heaven. Roads are more potholes than pavement, phallic symbols adorn the sides of buildings, red chilis left to dry hang from windows and under eaves. Monks in red robes buff temple floors by sliding stockinged feet across square pads of black yak fur, archery is the national sport, and the wind is infused with the echoing of meditation bowls and drums and horns, and prayer wheels turned by river water. 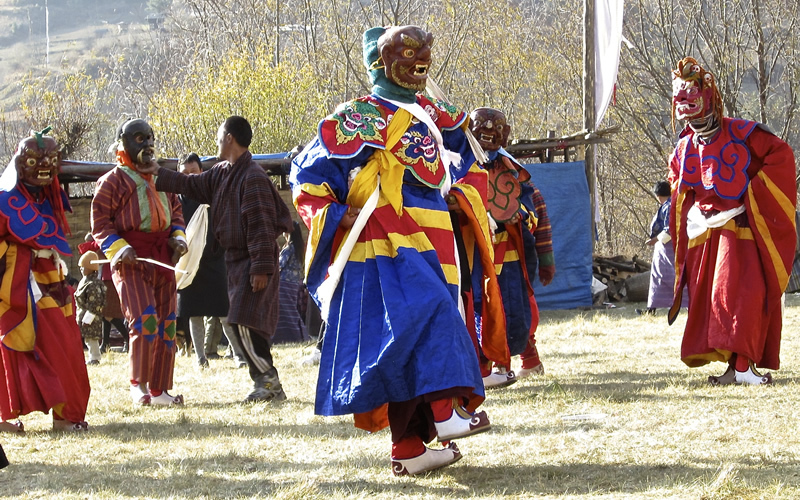 Whole communities dance away the evil spirits, praying in earnest. We were a small group on tour, our three weeks too short and none of us wanted to leave. On the drive to the airport, our guide, Karma, leaned over the front seat to face us with his olive skin and sculpted cheek bones accentuated in the morning light. Tong ha ha, he said. It’s an expression in Dzongkha—the language of Bhutan. It means the sound of emptiness, like the reverberation of an empty pot that clangs with a dull thud. He tapped his fingers against his palm to demonstrate. Tooonnngg. Tooonnngg. It is also the empty space in your heart when someone leaves. Tong ha ha. The sound of emptiness, like a sorrowful good-bye.